“2018 is expected to be a pivotal year for Oil Search, with many activities reaching important milestones,’’ Mr Botten said when releasing the company’s full year results for 2017 today (February 20th, 2018). The company’s net after tax profit rose 236% to $US302.1 million, buoyed by strong oil and gas prices, and record production. “Oil Search reported a net profit after tax of $US302.1 million, 236 per cent higher than the net profit in 2016,’’ Mr Botten said. “Sales revenue benefited from the rise in global oil and gas prices, with the average realised oil and condensate price increasing by 24% to US$55.68/bbl and the average realised LNG and gas price 21% higher, at US$7.67/mmBtu. This more than offset slightly lower sales volumes, driving a 17% increase in total revenue to US$1.45 billion. Speaking about LNG expansion, Mr Botten said: “Productive, high level meetings were recently held between Oil Search, ExxonMobil and Total to discuss the results of the downstream development options that were received by the PRL 15 joint venture partners last December. “The partners have reached broad agreement on the preferred development concept, which will be presented to the PNG Government and other PNG LNG and PRL 3 joint venture partners for endorsement. The development concept that will be proposed is likely to comprise the construction of three LNG trains, with total capacity of approximately 8 MTPA. “Two of these trains are likely to be dedicated to Papua LNG, supplied with gas from the Elk-Antelope fields, with an additional expansion train underpinned by gas from the existing PNG LNG fields and the P’nyang field. We expect negotiations on cost sharing arrangements and the principles governing integration to commence shortly, which will enable the completion of downstream and upstream technical studies. “Oil Search expects that discussions with the PNG Government on project gas agreements will commence late in the first quarter/early second quarter of 2018, with a decision on the Front End Engineering and Design phase in the second half of 2018, subject to partner approvals and progress on Government negotiations. * Maintain the focus on personal and process safety and target improvements in all safety metrics. - Complete the negotiation of cost sharing and integration agreements between the PRL 15, PRL 3 and PNG LNG joint ventures. 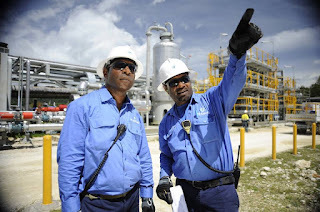 - Negotiate gas agreements for LNG expansion volumes with the PNG Government. - Complete technical studies supporting integration. - Commence equity marketing of Oil Search’s share of expansion LNG. - Commence discussions with prospective lenders on joint project financing. - Make a decision on Front End Engineering and Design. - Progress the Associated Gas Expansion (AGX) opportunity, to increase the volume of gas being provided to the PNG LNG Project from the Kutubu, Agogo and Moran fields, to support PNG LNG expansion. - Support the PNG LNG Project operator in progressing the tie-in of the Angore A1 and A2 wells into Project infrastructure and undertaking modifications to the Hides Gas Conditioning Plant in the second quarter of 2018. - Sign binding contracts for an additional 1.3 MTPA of LNG offtake. * Continue to focus on cost reductions and improving efficiencies across the organisation. * Undertake well work activities on operated oil fields to help mitigate natural production decline. * Drill the Muruk 2 appraisal well in the North-West Highlands and Kimu 2 and Barikewa 3 in the Gulf and Forelands. * Acquire seismic in the North-West Highlands and onshore Papuan Gulf Basin, to mature prospects adjacent to existing or planned infrastructure for potential drilling and development, subject to establishing a clear route for commercialisation. - Assume operatorship of the Alaska North Slope assets. - Build a locally-based development and operational team in Anchorage. - Undertake preparations for appraisal drilling in 2019. - Create value from the Option. - Supporting the PNG Government, where possible, to address outstanding PNG LNG benefits distribution delays and LNG expansion activities. - Completing, on behalf of the PNG Government, the construction of APEC Haus, a new function centre that will house the Asia-Pacific Economic Cooperation Summit in 2018. - Completing the construction of a 58 MW gas fired power station in Port Moresby and making a Final Investment Decision on the Markham Valley Biomass Project. - Continuing the Company’s extensive social programmes, managed both directly and by the Oil Search Foundation.